What kind of steak? The big thing here is something fairly lean. I tend to buy either top sirloin steak or loin tip steak. The thinner you slice it, the faster it cooks and the better the dish. Also, do keep an eye on it, since it really only takes 60-90 seconds per side to cook through. Why broccolini? 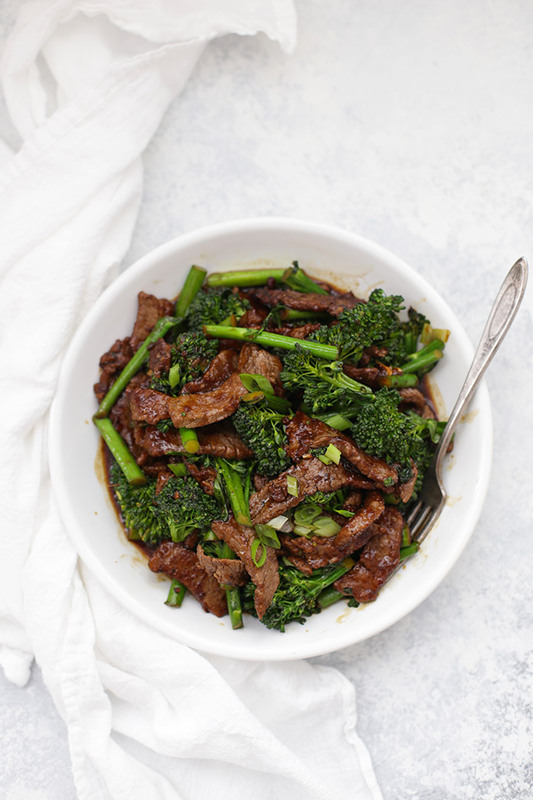 I’ve been on a broccolini kick because it’s so tender–even the stems! I don’t have any waste, and the flavor is a little bit more mild. I’ve also made it with broccoli with great results. Use whatever you can find! Change it up! Not digging broccoli? No problem! Try snow peas, snap peas, bell pepper strips, or mushrooms. It’s all good. Arrowroot vs. cornstarch. Arrowroot is a grain-free starch that’s often used as a thickener and is common in paleo cooking. If you don’t have it, feel free to use cornstarch. It lends a bit of crispiness to the beef and helps thicken the sauce. One thing that can make arrowroot a bit trickier to work with is that if you boil something too long with arrowroot in it, it actually loosens back up and thins out again. If you’re an absolute beginner cook, you may find cornstarch easier to work with, but if you’re fairly comfortable in the kitchen, it’ll be no problem if you follow the directions. Used for this recipe: Ceramic Skillet // tamari or coconut aminos // arrowroot or non-GMO cornstarch. *PALEO & WHOLE 30 Notes – For Whole30/Paleo, you *must* use coconut aminos and arrowroot to stay compliant. 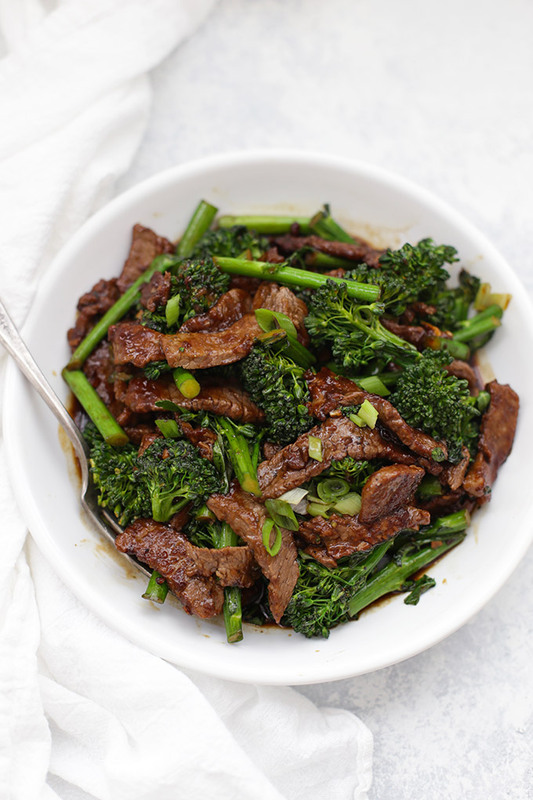 Broccolini or Broccoli- I’ve been on a broccolini kick because it’s so tender–even the stems! I don’t have any waste, and the flavor is a little bit more mild. I’ve also made it with broccoli with great results. Use whatever you can find! I’ve cooked chinese/oriental recipes for years. This was way too salty. Sorry it wasn’t to your liking! I use low-sodium soy sauce/tamari and it’s just right for me. I’ve even added a touch of brown sugar to to help it not be so salty. I made this recipe tonight and halved the light soy sauce and it was way too salty. My husband put his food in a strainer and ran water over it but it was still too salty. I’m sorry to hear that Marilyn! I tried this recipe with low sodium soy and it was delicious! My 2 boys thought it was better than our favorite restaurant. Thanks for sharing! I’m so glad you enjoyed it Paige! I made this tonight (using Tamari) and it was really salty and saucy. I loved the flavours but will half the sauce amount next time I make it. I served it over a bed of cauliflower rice and my 5 year old is devouring it. Rochelle – So sorry it wasn’t to your taste! I use low-sodium tamari (see the recipe notes) and it seems to help. Otherwise, you can always add more water to the sauce to thin it out and dilute it a bit. Wayyyy too salty!! If I make this again I will use just a quarter cup of tamari and the rest water. Thanks for sharing your recipe. I made this for my family using the organic low sodium tamari and it was way too salty. I would for sure make this again but adjust the amount of tamari to less that 1/4 cup. I haven’t frozen it before–I think it would be pretty soft upon thawing and the meat would likely get overcooked. This was delicious! I used coconut aminos, added some broth when I threw the broccoli into the pan, and also added 1/4 cup of coconut sugar to the sauce. Everybody in my family devoured it! Thank you for the recipe. Oh, that’s so great to hear! So glad you enjoyed it! Ha ha! I understand! Nutrition software isn’t in my budget right now (hopefully soon! ), but I like using the free MyFitnessPal site or app–you can download recipes straight from the web so you don’t have to add each individual ingredient. Is this recipe loaded into myfitnesspal? If so what would I look under? If you can’t find it, you can easily import it. Under “More,” select “Meals, Recipes & Foods,” then “Create a Recipe.” Select “Add from the web” and type “One Lovely Life Beef and Broccoli” into the search box. You can then import the recipe from there. Hope that helps!!! I am wanting to know the nutrition facts about this meal! I did try the MyFitnessPal app and it was not working. Just wanna know how many calories, how many carbs and how much protein. Thanks can’t wait to try it out! Lindsey – I’m sorry you’re having trouble. I’m hoping to get nutrition facts on my site within the week! OMG! I love this and so did my family! It was so amazing and they didn’t even know it was healthy for them! It was so simple to make and not expensive at all! Please send me more recipes! Randi – I’m SO SO GLAD to hear that! You made my night! Here’s to many more delicious dinners to come! Eating this as I type and it’s fantastic. And SO FAST to make. I used coconut aminos and followed the recipe exactly and it’s awesome. MyFitnessPal calculates this (made with coconut aminos) as 218 calories, 23g carbs, 5g fat and 23g of protein. Tarisa – THANK YOU for running it through MyFitnessPal! I’m hoping to get nutrition facts up in the next few weeks, and this is SO HELPFUL for others in the meantime. I’m so glad you enjoyed it and really appreciate you taking the time to comment and share back! Making this for dinner tonight. this will be the 3rd or 4th time. My boys love it and i love the ingredients. I used coconut aminos, arrowroot powder and broccoli. FYI it won’t let me give this recipe 5 stars. This was yummy! And thanks for including a video! As written this isn’t whole30 compliant. You really should make a note about the soy sauce. I’m very new to the Whole 30, and I used the tamari sauce, which of course is a no no. The instructions read like tamari is for whole 30 folks. You might look at rewording a bit to make it super clear that the coconut aminos is the only Whole 30 compliant choice. Thanks for the feedback Carrie! I included the (Use for Whole30) after the coconut aminos in the recipe instructions, but I’ll add anther note as well. She is very clear about components being substituted if following Whole30. I made this last night and it was scrumptious! I’m looking to the leftovers that I packed for lunch today 🙂 I have been looking for a recipe that has a thicker sauce like most takeout does and this is it! I just printed the recipe out for future reference. Thank you, thank you, thank you, and happy 2018! Megan – Oh, hooray! I’m so glad you enjoyed it! Happy 2018 to you too!!! Oooh, so glad to hear that! I use chicken more often than beef, so that would be a good way to change things up! My very picky teenager and I loved this! I made this and the flavor was so great, but it was super salty. I missed the note about low sodium! I also should have let it bubble longer to thicken. I will definitely remake it with low sodium. I wish I could find broccolini – they never have it in my stores. Broccoli worked great, but it did take quite a bit longer to cook through. Maybe i’ll chop it smaller next time. Overall, a winner! A million times better than all the disappointing take out I’ve had. Anna – Well I’m always glad to beat takeout. Hopefully the adjustments will bring it right where you like it for next time! Lindy – I haven’t tried tapioca starch. I’m not sure how the texture would turn out…if you give a try, I’d love to know how it goes! Used Tapioca flour and it was perfect! Made this for dinner tonight, and we loved it! 10/10! That’s wonderful! So glad you enjoyed it Kathy! Is that green onion I’m seeing in the picture just an additional garnish? Made this for the first time tonight! 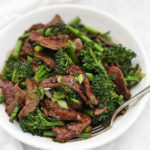 Eating it as we speak, this is the most amazing beef and broccoli Recipe I’ve ever had, including takeout! And I love the simple ingredients. I made it with the coconut aminos and arrowroot and it was not too salty at all! Thank you so much for sharing! Oh my goodness! What an amazing review. Thank you for sharing this with me!!! I made this tonight and everyone loved it!! My husband gave it an 8.5/10, which is high praise. Thanks for this one, Emily! WOW! I’m so glad! That’s the best! Oh hooray! I’m so glad you loved it! YAAAAY! I love hearing that. Thank you SO much for sharing! This was great! I used coconut aminos and added a teaspoon of brown sugar and a tablespoon of sriracha for spice, it was delicious! I made this with my first time trying coconut aminos. It was great! Oh, I’m so glad! We love it too! I made the paleo version of this but with chicken. SOOOO GOOOD!!! That sounds awesome! I need to try it! Did you do anything different? My daughter prefers chicken and I wondered if this would work to just substitute chicken for beef. Can you use tapioca starch instead of arrow root? My meat came out slimy with the arrowroot on it. What can I do different next time? Hmm…I’m sorry that happened! I’d love to help. Was it crispy when you pulled it out of the pan? (before adding the sauce?) Or was it slimy after adding the sauce? Sometimes, if there’s too much moisture (on the beef or juices in the pan) it can start to thicken those juices when they’re browning rather than providing a crispy coating. You could try patting off your beef with a paper/kitchen towel before slicing to reduce the liquid on the beef, which might help with a crispier coating. 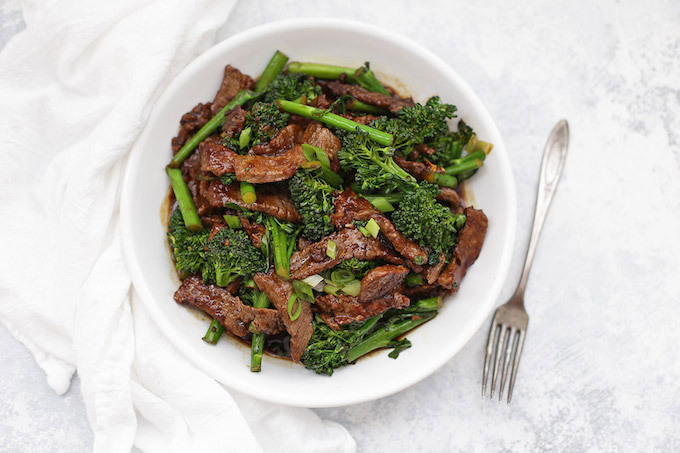 Or, you could skip coating the beef in the arrowroot and simply stir-fry it, then add the arrowroot to the sauce mixture to thicken when you add it later. Correct me if I’m wrong, if this were Whole30 approved there would have to be no soy, right? This was so easy to make and SO delicious. I used coconut aminos, which I normally don’t like, but I think the flavor really worked and made it a tad sweet. My girls loved it. I will definitely keep this recipe, thank you for sharing!! YAY! I love hearing that! I’m so glad you enjoyed it. Thank you for sharing! This recipe is amazing! My husband and I are both on the whole 30 and we felt like this was cheating! So yummy! thank you so much! Ahh! I’m so glad to hear this! Best of luck on the rest of your Whole30! It’s still a bit salty for my liking but next time I would probably do half water and half low sodium soy sauce and up the ginger. I do think the recipe is a good one and totally adjustable to everyone’s preference. Thank you! Thank you so much for your feedback! It sounds like a perfect plan for next time! I used coconut aminos and wow!! This was great. I added some green onion and served it with cauliflower rice (the frozen kind cause I’m lazy) and some sliced pineapple. This was so delicious:. Thanks for sharing. I haven’t used arrowroot before. Is this just a substitute for cornstarch? I’m SO glad you enjoyed it! That pineapple sounds like the perfect side for this! I’m so glad to hear that! Thank you so much for sharing! I made this for dinner yesterday using coconut aminos. (For the first time). I served it with quinoa/ brown rice. It was delicious! I’m so so happy I found This recipe. It was easy, too! I breastfeed and my baby is cow milk protein and soy intolerant so there’s not a lot of dinners I get excited about. This one is my new favorite! Thank you!! Oh, I’m SO GLAD! I had to eliminate a lot of things while nursing my oldest–I know exactly what you mean! I’m on Whole 30, I don’t have any arrowroot, but I do have tapioca flour. Do you think that would work as a substitute? Suzanne – You could certainly give it a try, though do keep in mind that tapioca can sometimes get a bit gummy, so you’ll want to watch it (and whisk the sauce very well). Best of luck on your Whole30!!! I loved this dish! So happy to find a tasty paleo meal! I will be making this one again! Oh, I’m so glad to hear that! Thank you for sharing!!! So F***ing good! My fam and I loved it and will do it again! Recipe was perfect, wouldn’t change a thing! Good work! Agh! I’m so glad you loved it! Love this recipe-have made it many times for just the hubby and I, and also bigger batches for my many family members who are GF/Soy/Grain/corn sensitive. I have used both chicken and beef, and both work out beautifully. I use coconut aminos, since I can’t do soy. I also use unsalted broth in place of the water, that way if it gets a bit on the salty side (usually only if I double/triple the recipe) I can thin it out without taking away any flavor. I also only use potato starch, (can’t do corn, and never tried the arrowroot) and it works out great! Thanks for a great addition to our weekly menus! I’m SO GLAD you made it and enjoyed it! Thank you so much for sharing! I used corn starch and soy sauce in my recipe and it turned out delicious! Thank you for your recipe. YAY! I’m so glad you liked it. It’s one of my favorite dinners!! Jenna – You just made my day!!! I’m so glad to hear that. Thank you for sharing! Excellent! My husband and I ate every last bite with brown rice. 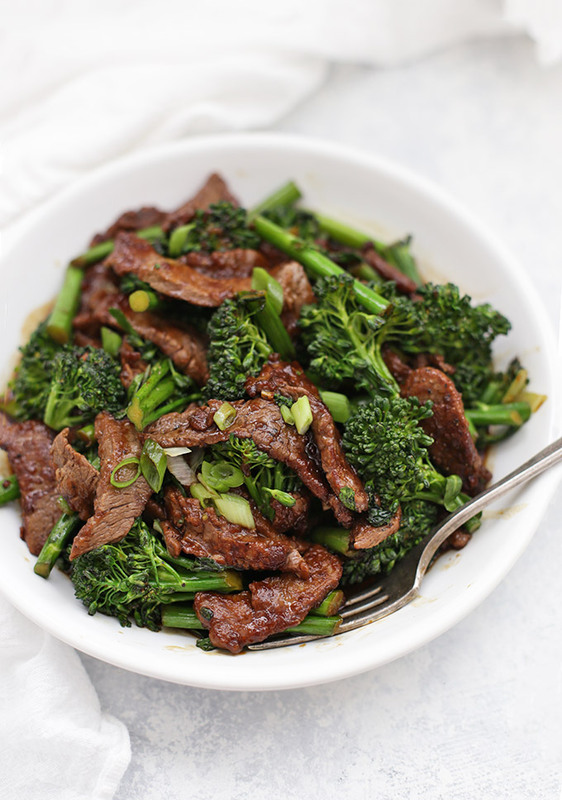 Made with low sodium soy sauce and broccoli. Will make again and try other veggies. Thanks for sharing. Patricia – I’m SO HAPPY to hear that! Thank you for sharing this with me! I don’t understand why people trash a recipe because it is “too salty”. Are people not aware of their own taste preference while preparing meals? If you prefer less sodium, reduce salt and/or use low sodium ingredients. Pretty simple concept. It’s like someone giving a one star review of an otherwise excellent product, because they had a shipping issue. Why not say “Great pair of shoes, runs half a size large, consider sizing down by one half.”? Or “Great recipe, consider using low sodium soy, reduce salt, if that’s your preference”. It destroys the credibility of ratings and reviews and at the very least is annoying. Have you figured the nutritional facts for this recipe? Used Coconut Aminos and we loved it!!! Great recipe!!! I’m SO happy to hear that! Thank you for sharing!!! Just made this last night. Used lower sodium soy sauce and followed the recipe exactly. OMGosh! I can’t wait to eat my leftovers for lunch!! It was so good! My kid prefers chicken so I am gonna try it that way soon! Just made this last night and it was AMAZING! I always struggle cooking Chinese type dishes and for some reason this one worked! Going in the recipe box straight away! Yesss! I love hearing this! I’m so glad you enjoyed it!